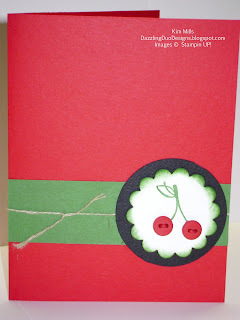 Summer Mini Catalog Designer Paper Shares $9.50. Here's what you'll get with this Product Share: 30 sheets of Designer Paper that are 6 x 6. Designer Paper includes: Presto Patterns Specialty, Travel Journal & Island Oasis. The Designer Paper share will ship 1st class mail with FREE SHIPPING. Email me today with your order!!! I know that I have been MIA for the last week or so but I have been busy. Last week, I was busy making 25 notebooks for the teachers at Sacred Heart. Then I was in charge of the Mother-Daughter Breakfast at church!! Besides my busy schedule, my kids had softball and track!!! Ok, now onto the card!! This is very simple!! I did not place a sentiment on it yet because some times I like to leave them blank and then place it on when I decide later!! I have been busy today with stamping so now I have to upload all of my photos. With our recent Color Renovation announcement, Stampin' Up! has experienced a spike--much greater than anticipated--in demand for some of our retiring colors. A significant number of colors in both card stock and re-inkers have gone into backorder status and a few have even sold out completely. Stampin' Up! anticipated increased demand on retiring colors based on historical sales information for previous color transitions, as well as current buying behaviors. Obviously, even with the most careful planning, the response to a transition of this nature can surprise everyone--and it has! For re-inkers in retiring colors, as we run out, they will be placed on backorder status and those orders will be filled as quickly as we receive the product. We will continue to do this to the best of our ability through May, and then the re-inkers will be available while supplies last in June. Card stock presents a bit larger problem, as the process of ordering and producing new paper from the paper mills is very involved, and SU! can't order significant quantities at this point in time without putting the production of the new colors in jeopardy (and we know you want those!). To help us be able to provide you with the card stock in the retiring colors for as long as possible, SU! will be substituting textured paper for some of the smooth colors--including card stock in 8 ½ x 11 as well as 12 x 12--where the smooth is no longer available. When colors are out of stock, we will be filling as many of those as possible with textured card stock. Because the demand for each color varies, we are unable to provide a list of what colors of card stock will be substituted with textured, or at what point that will happen. However, if you receive a package of card stock that is textured instead of smooth, there will be a sticker on the package indicating that change. There will be no change in item code or price for these substitutions. Four colors have already sold out of smooth 8 ½ x 11 and we have no idea how fast cardstock will now sell out. Please keep in mind that an instance may arise where we are unable to fill orders on a specific product, and it will become unavailable before the end of May, but we hope those cases will be minimal. Our main goal is to serve you the best that we can. If you had any plans to order to order any of our retiring colors, I strongly suggest you do so as soon as possible or you may find you will be unable to get your favorites very soon. Please contact me if you have any questions or interested in placing an order!! No card post today. My daughter has a softball tournament. I hope to stamp tonight and then post it tomorrow.